Tucked into an industrial corridor on West Fillmore Street is a company that doesn't pull any punches - because punching holes is its business. Harrington & King Perforating Company punches holes for a living, and they've been doing it for more than a century and a quarter. It all began back in the heyday of the industrial age. The year was 1883. The president of the United States was Chester Alan Arthur, and the Mayor of Chicago was Carter Henry Harrison, Sr. A big favorite of audiences everywhere was Buffalo Bill's Wild West Show, and in Chicago, the World's Columbian Exposition started. On May 4 of that year, S. R. Harrington, Rockwell King, and two others incorporated a small company to do metal perforating. Befitting Chicago's early status as a manufacturing hub, the company's first plant was located at the southwest corner of Washington and Jefferson Streets on the Near West Side, only blocks from what is now Oprah's Harpo Studios. Working on dirt floors, employees did much the same kind of work that the plant generates today - putting holes in a variety of materials. One early perforating machine relied on human power in the form of a foot treadle. Within two years, H&K had expanded and needed more space, so the company moved to Union and Erie Streets. In the late 1880s, H&K opened a sales office in New York and in 1927 operations were moved to Fillmore Street and Central Avenue, not far from the city's western edge, where it remains today. Who could have known that more than 12 decades after it was founded, H&K would still be thriving? 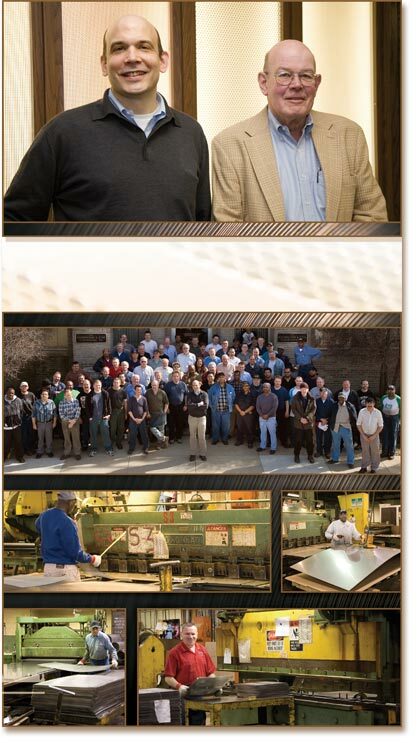 Today, with 155 employees around the world, H&K is still headquartered in Chicago but now is the nation's leading producer of perforated materials. H&K's Web site boasts, "From foil thin to one-inch thick, we can do it all!" And, with sales offices not just in Chicago but also in New Jersey and Tennessee, and warehouses in Chicago, Tennessee, New Jersey, Nevada, Texas, and Florida, H&K does indeed do it all. When one looks closely at the myriad uses of perforated materials, it is clear that perforation is vital to every area of industry. H&K serves a wealth of basic industrial and consumer markets, including: acoustical treatments, such as buses, railroad cars, and aircraft; straining and filtering, such as strainers for fruit juices and chemicals; automotive radio grills, such as instrument panels, tractor radiator grills, and muffler heat shields; graters and anti-slip, such as potato-peeling machines and feed-roll surfacing for printing and textiles; guarding and ventilating, such as ornamental grills, machine guards, and sound traps; separating and spacing, such as storage battery separators and pipe spacers; and cleaning and grading, such as grain and seed-sizing screens, and dewatering screens. One of H&K's catalogs is titled "Holes in a Hurry," aimed at the large market for in-stock sheets and coils, which the company offers for immediate delivery. Other markets include run-to-order perforating and custom design perforating. For architects, builders, and industrial designers, H&K's Architectural Handbook contains illustrations of the world's largest library of decorative perforated patterns. Is H&K affected by the trend to move work such as this offshore, to take advantage of lower labor rates? No, not really! A lot of H&K's work is done on a rush basis. If their customers can get the work done locally, they will. And some companies have taken their business overseas and then come back because of the expenses associated with overseas shipping. Computer numerical controlled technology is used to automate the presses for doing perforation. But some early production techniques remain. Shop personnel still use wagons pulled by forklifts to move materials and finished work around the plant. Sometimes automation isn't the best way of doing the best work. The company's biggest challenge today? One long term challenge is changing production technologies - whether there's another means of putting holes in things. H&K strives to identify ways of meeting the market needs, but there may be other unpredictable market forces that could change our product line. H&K's track record shows, however, that the company's combination of old and new techniques, combined with its can-do attitude will help it meet the challenges of the future.